It was an extremely important moment. Rand Paul represents the sort of isolationist wing of the Republican party; by this direct, fearless attack on him by Christie, I think he takes up the mantle of the majority of the GOP, which is interventionist. And that’s a really important moment. You betcha! Read my lips...rally behind gun grabber/anti-Second Amendment zealot Chris Christie as the Republican standard bearer and, ultimately, the 2016 Presidential nominee, and the gun vote stays home! Say hello to President Hillary. C'mon guys, even Alf the Wonder Beagle can figure this one out. I like Christie's nasty repartee as much as anyone, but this is the same man who quite literally stepped up to help the Obama re-election when it was flailing and, unlike Romney, who could at least make a case that he wasn't really truly antigun, Christie's whole career has been about savaging the Second Amendment...good grief, New Jersey is HELL for gun owners. And it's a hell the mainstream Republicans want us to port over to the whole United States. Are they blind? Deaf? Are they honest-to-God that stupid? A portion of the so-called "Republican base" refused to turn out for Mitt Romney. Imagine the bloodbath if the RINOs give in to their little inner progressive and run a man who has spat on one of the largest sectors of the Republican base. Sorry...didn't mean to rant. And hey, interventionism has worked so well for us. Look at Iraq...whoops...Afghanistan...nope...every single place in the Middle East...nope, we tanked there, too. Maybe it's time we started thinking of NOT doing the same thing over and over again and being surprised when it doesn't work again! BTW, one more piece on Zimmerman, this one from Megan McArdle. I wholeheartedly agree with her overall premise, that we don't need tougher standards for self-defense law, but I do think there's still a "Zimmerman must have done something wrong" sense with which I don't agree. 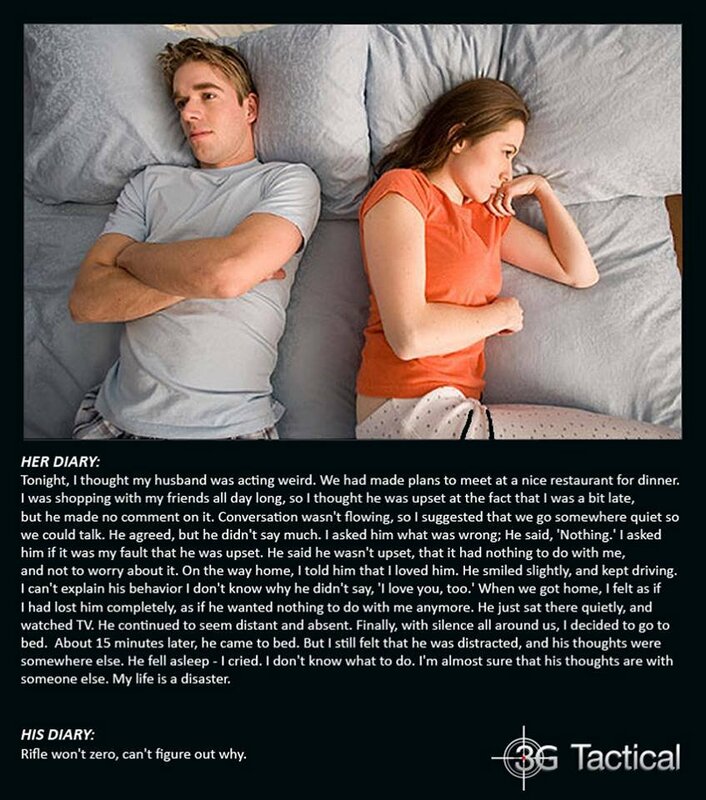 Read the whole thing. My Sweetie and I are making home-made pizza tonight (pesto shrimp and a mushroom/tomato/onion/pepper are on the menu). I'm sticking with Sam Adams Oktoberfest beer, which I'm not completely in love with, but it does have a nice malty finish. Looks like ammo will be Hornady Superformance 165-gr International, although I'll do a lot of my practice with Black Hills 180-gr. Lowa hiking boots. The Lowas come highly highly recommended, ands far so good. For a few years I got real stupid and skimped on hiking boots. Last year at the Crimson Trace match I was wearing a, shall we say, less expensive pair of Columbia light hikers. I thought my feet were going to explode. After the match, I threw them away. For hiking I defaulted to my winter boots, Vasque Gore-Tex. They are super warm and dry in the winter (I use them snow-shoeing), but warm for summer wear. A number of people recommended the Lowas, so I decided to give them a try. For instance in 2006 a defendant called Blackall had been shot and rendered a paraplegic by an unknown gunman who was never identified. On a further occasion a man knocked at the defendant’s front door and put a gun to his head. He reported this to the police but no one was apprehended. He kept a loaded revolver thereafter for his own protection. Four months later the police came to his house and he told them where his gun was. His exceptional circumstances were taken into account to reduce the sentence of five years to three years imprisonment. That's what our blood enemies like Michael Bloomberg and Mr. Gabby Giffords (I'm sure he has a name of his own, but, really, who cares?) want for us all. In England and most of the rest of what we think of as the First World, violence is the exclusive property of the State. And the State enforces an "equivalency" of violence, that is, the non-State exercise of violence is all the same and prohibited, whether it is by an aggressor against an innocent person or an innocent person against an aggressor. Not the country the Founders envisioned, eh? We got 5 scenarios done for the 2014 season of THE BEST DEFENSE, and they are just super! These scenarios are in direct response to viewer requests...we think you'll really like them! I've decided I'm going to shoot the Media/Staff Crimson Trace Midnight 3-Gun this year. I probably won't be changing much over last year, depending on what I get put together before the mid-August match. I'm still bummed that I didn't get to shoot the Ruger Rimfire Worlds...it was the right decision given our production issues at the match, but I hate it when work cuts into my shooting...LOL! Maybe I can get in a state match or so before the end of the year. Did I mention that I picked up the Africa rifle, a Ruger Guide Gun in .300 Win Mag? UPDATE...I did carve a few minutes out late this afternoon to go to the range after dealing with still more stuff on the Potential New Secret Hidden Bunker (anybody who tells you money is loosening up is lying through their teeth, BTW). I managed to get my Sweetie's rifle re-sighted in with the Leupold 1.5-4X Firedot I used down in Whittington while we're waiting for the Swaro to come back from the shop. The Millett I slapped on the SR-556e wasn't even on paper at 100 yards, and with a storm coming in I bagged sighting it in until another day...after I find my laser sighter to save myself some time. 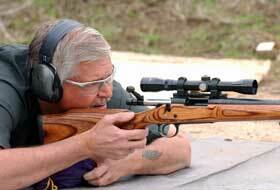 I did manage to get off a few rounds from the Africa rifle with the iron sights on it with Black Hills 180-gr TSX. I remain amazed at how well the muzzle brake on the Guide Guns (which I believe I have to remove for Africa, since everybody knows only terrorists have muzzle brakes) works. 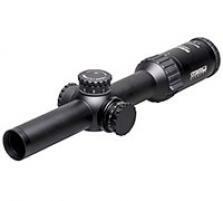 I'll get the glass next week, and the Leupold VX6 2-12X IR is definitely high on the list. Am also looking at the Burris Fullfield E1 3-9X IR. I also got to shoot the Rock Island 9mm hi-cap Jim Anglin at Sailor's Pistols has been overhauling and that came home last week. Sweet! Shoots like a house-afire. There's a really interesting thread on The High Road about what makes a ""rifleman." I bring it up here because it's a topic in my mind these days. I've spent most of my competitive career shooting handguns of various favors. In recent years, thanks largely to cowboy action shooting, I find myself drifting more and more to long guns. Interestingly enough, I was talking to my friend Ken Jorgensen for Ruger at the RR Worlds last weekend, and he mentioned the he's recently become completely enamored with rifles as well. The challenge is fascinating. So what's the general consensus of what makes a "rifleman?" To be sure, I have an Appleseed "Rifleman" patch I'm very proud of, but I would not presume to call myself a rifleman. Since I started shooting 3-Gun, I've been humbled by how much I have to learn about the rifle. I'm just starting to say, "Oh wow...so that's how that works!" I grew up in a deer hunting family in Tennessee. In Tennessee scrub, a long shot is 50 yards, so at least in my family there wasn't the obsessive attention to detail that seems like the hallmark of a good rifle shooter (and I pretty quickly went from a Winchester 94 "thurty-thurty" to a Model 29 .44 Magnum). You can get away with a lot if you're working inside 50 yards. We're in Tulsa filming TBD...I died twice today...once when Mike Janich beat me to death with a hammer in my garage...the second time when he stabbed me to death in somebody's lawn. 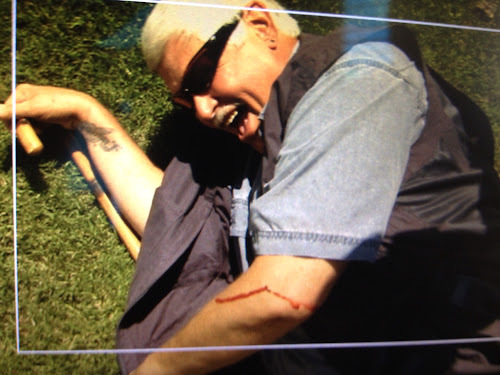 Note me crying like a little girl after being savagely "stabbed" by Mike with a "drone" knife. It turns out than when you cleverly jam your elbow into even a dull knife 1) you bleed like the proverbial stuck pig, and 2) wowie-zowie it hurts! LOL! Note to simulators...never let a good puddle of blood go to waste. We've got 3 sims to film tomorrow, but I don't think I have to die. It's time for Seeklander to die! We filmed them for SHOOTING GALLERY this weekend in Tulsa. Mark Passamaneck put together one heck of a match...I thought the stages were superb (although, sadly, I didn't get to shoot...work, occasionally gets in the way of shooting). We followed Allie "Allie-Cat" Barrett, the 16-year-old rimfire shooting flash from Missouri, who helped us out by winning High Woman in this year's World's. Congrats, Allie! ...pretending to be a television person. Got 3 days of SHOOTING GALLERY filming, followed by a couple of days for THE BEST DEFENSE. While I'm getting ready for those days, I'm watching rough cut episodes of GUN STORIES (which are just wonderful, BTW...if you're not following this season on Wednesday night, you're missing our best work). Of course the Internet connection hear at the Secret Hidden Bunker is so slow that it makes watching any video stream just plain painful. Gunwise, I spent a few hours yesterday setting up a Ruger SR-556e for 3-Gun. Piston guns like the Ruger are not popular in 3-Gun because of their heavier weight than a gas gun . This one has been worked on by John Paul at JP Rifles and is pretty sweet. I put a Millett DMS 1-4X on a Burris P.E.P.R. mount on it to see it runs. The Milletts are often deep-discounted, and I have a couple of them I got a great prices that I use as "bread-and-butter" scopes for testing, on back-up rifles, etc. BTW, I was a Burris in Greeley, CO, earlier this week, asnd my friend Matt Joyner, who handles Steiner's government and law enforcement sales in the U.S., had one of the 3 Steiner 1-5X scopes in the country (the other 2 are in military hands for testing). It's very fast to acquire and as a true 1X you can use it the same way you use any red dot, with both eyes open. Matt had it on an H&K, and I said hey, I'll just take this home! I didn't, but my name is first on the list when the first 5 arrive in a couple of weeks. The Swaro is in the shop since I managed to snap off the illumination switch. My Sweetie copped the Leupold Firedot 1.5-4X for her Stag 3-Gun rifle for next week's local match. Forget the scope...I need a Designated Shooter...Paging Kalani Laker! "It's time to question laws that senselessly expand the concept of self-defense and sow dangerous conflict in our neighborhoods." That, of course is Eric Holder, the Attorney General of the United States — chief gun-grabber, Mexican murderer and race-baiter, striving to create yet another crisis that will allow the rogue Obama "government" to destroy a little more of the Constitution it so abhors. 1) Profiling. When the president calls for “calm” in the aftermath of the jury speaking, he is profiling. When police departments call in the manpower, put special command units into specific locations, and beef up for potential demonstrations or rioting, they are profiling. When celebs and rap stars use social media to put out irresponsible incantations to bad behavior, they are profiling. They are, in fact, profiling far more invidiously than anything George Zimmerman was accused of. Their presumption is that the African-American community is immature, impulsive, prone to violence and incapable of understanding the nuances of the case. More volatile and less rational, this community demands special attention in order to nurse it through an emotional crisis, spare it and us from irreparable damage. It is, in fact, based on an us/them dichotomy. Any individual who argued such a point would be destroyed; these gentlemen and entities may do so without consequence, except an affront to reason and the stench of hypocrisy. Steve's closing point, and one that I agree with, is that the Kel-Tec worked perfectly within the context it was designed for. It's become fashionable to diss the little 9mms and .380s, which are, parenthetically, the best-selling firearms in the U.S., for being what they are...hard to shoot, tough to hang onto, less practical accuracy that a larger platform, etc. 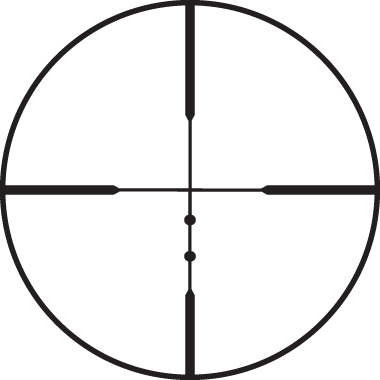 Yet the Martin shooting shows the little guns to work extremely well in the "hot zone" distances they were designed for. Do I want to shoot groups at 15 yards with a Kel-Tec 9mm, a Ruger LC9, a Kahr 9mm, a Sig 938, an S&W Shield or Beretta Nano? Not really. 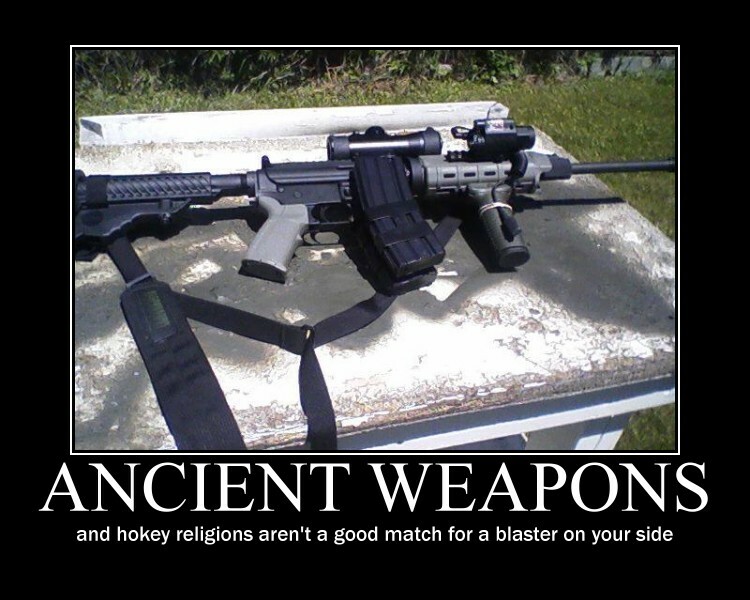 But I do know that one of those pistols in my pocket will do the job it was designed to do. George Zimmerman practiced self-defense. That's not healthy. That's an obstacle to what the left wants. Now, they want you to believe they're upset because George Zimmerman killed a black guy. When you get right down to it, that's not what bothers 'em. It's the gun. It's the ability to self-defend. It's the ability to protect one's self-and not need the police, the government, or what have you. That's what really bothers them. Legal Insurrection is covering all the reaction, but I wanted to make some quick points on the Zimmerman not guilty verdict, which I'll be elaborating on this week's DOWN RANGE Radio. 1) Justice has been done, but George Zimmerman will never get his life back. Every one of us who carries every day needs to understand that. There is a price to be paid, even if you're 100% right! And Zimmerman's ordeal is not over yet. I strongly suggest you read this Breibart account of a worst case. 2) As I said in the beginning, the case pivoted on whether there was one incident, initiated by George Zimmerman and ending in the death of Trayvon Martin, or 2 incidents, the second initiated by Trayvon Martin and ending in his death. 3) The prosecution failed in their blunt attempt to equate the right of self-defense with the extent of injury suffered by the victim. The "reasonable person" doctrine prevailed. 4) What the jury was not allowed to see, the tweets, the social media, from Trayvon Martin showed the 17 year-old to be a wannabe thug, a doper experienced in fighting — including one fight he lost because he was taken to the ground and pounded MMA style — and looking for a gun. Rather than the "accidental tragedy driven by race" scenario still be presented in the MSM, given all the evidence it is not irrational to speculate that Martin saw an opportunity to "make his bones." And he took that opportunity. The learning point here is that we cannot know what is in someone else's head...the young man walking toward you might indeed be an angelic choirboy...or he may not. This may be the day that angelic choirboy decides to become a full-fledged gangsta, and you're "it." Based on this, do we ever drop our eyes, turn our back, lose sight of the (however remote) threat? 5) As stated by myself, Michael Janich, Mike Seeklander, Marty Hayes and Rob Pincus in virtually every episode of THE BEST DEFENSE, if we are truly serious about our self-defense, we need to get beyond, "When all you have is a hammer, everything looks like a nail." Adding empty hand, improvised weapon, stick/pen/cane, even knife skills to your "tool box," gives you options. Skill buys options! You may indeed end up in the gravest extreme and have to go to the gun, but it will be because all your other options failed. 6) You MUST be able to articulate exactly what happened, exactly what steps you took and why you had no choice but to resort to lethal force. This is not an optional step. The entire remainder of your life hinges on your ability to articulate why you acted as you did. George Zimmerman did a lot of things wrong, but in the end he was able to explain quite clearly why he did what he did, and the evidence backed up his story. 7) As Zimmerman stated, when Martin began reaching for Zimmerman's gun, it wasn't Zimmerman's gun or Martin's gun, it was "the gun." All of us who carry fully understand that in any altercation we are involved in, there is at least one gun present — ours. In my very first formal self-defense course while trying — unsuccessfully — to get a license to possess a firearm in New York City back in the mid-1970s, my instructor, an NYPD detective, hammered away on the fact that if you have a loaded gun on your person, you cannot give up the gun. If you do, that gun will almost certainly be used against you. On DOWN RANGE Radio, I've talked extensively about the concept of "gun sense," being aware of the gun and its position relative to you and a potential threat. The TBD guys have talked about distance between you and the potential threat, and as much as possible keeping or adding to that distance. If you are in arms-reach of your assailant, the hot zone, there is always the risk that your gun is in play! See Point 5. 8) Violence is quick and brutal. We have been conditioned by television and movies (and, yes, some of our own training) to see violence as a sort of step-by-step process in which each step is telegraphed by the previous step...first "A," then "B," etc. We imagine this will give us the opportunity to ramp up our own defenses and be ready to respond. Instead, the first hint you might get that you're in a fight for your life is the punch to the face that drives you to the ground. 9) There are limits to situational awareness. Yes, it is your first line of defense, but no defense is 100%. You have to have a plan, a mental index card, that programs your response when situation awareness is either not applicable (last year's TBD "Restaurant Beat-down," for example) or fails. 5) "I'm happy to chat with you when my lawyer is present. I absolutely request my attorney, and I am respectfully invoking my 5th Amendment Rights to decline to answer any questions until he is personally present, sir." Finally, when you are "Mirandized," the officer will probably ask you, "Do you understand your rights, as I've explained them to you?" The best answer is, "Officers, I'm not answering that question, nor any other, until my lawyer is here, nor will I sign, nor initial, any document." We could go on for many more pages, but the foregoing pretty much sums it up. You must protect yourself, as no one else will! Granted, these are things none of want to think about. We always see ourselves as "the good guys," and we want the other good guys, the cops, to see us in the best light. Unfortunately, that urge for others to see us as "the good guys" is the rope we will use to hang ourselves. As I said on the podcast last week, the heads of the IRS "Took The 5th" before Congress. It is your right! Exercise it! John, who is a genius on this stuff, BTW, also discusses asking to be transported to the hospital after a lethal force encounter, as I mentioned in last week's podcast. You have just had the worst experience of your life...your heart is racing...you feel light-headed...you may or may not know how badly you have been injured...I think the emergency room is indicated. Best case, ask your lawyer to meet you there. 11) Have a lawyer to call! I do, and I carry that number on my person and in my phone. This is going to cost you some money, but so did the gun and the training. Meet with a criminal lawyer in advance, explain your situation as an armed civilian and that you would like to be able to contact him or her after an armed encounter. 12) DO NOT WALK INTO THE FAN IF YOU DON'T ABSOLUTELY HAVE TO! Burn this into your psyche and remember it every time your put your gun on in the morning! You do not have an invincible uniform with a great big "S" on the chest under your street clothes. You do not have a badge nor have you taken an oath to defend the public. You are not a "sheepdog" protecting the flock. Yes, every one of us has read Lt. Col. Grossman's essay, perhaps many times, but think this through. Our "job" is not to protect the public, but to protect those under our "umbrella" and ourselves, first and foremost. There are exceptions, and we've discussed them at length in the TBD active shooter scenarios, but we need to think long and hard about intervening in any situation where we are not in possession of 100% of the facts (which is, indeed, most situations). If we feel we must intervene in a questionable situation, we need to do so at the lowest possible level. Call the police and pay close attention to everything around you so you can be a good witness; video the situation from a distance; stay on the phone with 911; shout that the police are on the way; in short, exercise all your options before you step into the fray. Because when you commit, you must commit 100%, or you find yourself on the ground with your head bouncing off the concrete. 13) TRAIN! The skills don't come in the box with the gun. The skills don't come from watching TBD or reading what I or Marty or Massad or Rob write. Skills come from your commitment and nowhere else. Oh yeah, we ALL need to be in DEFCON 1 until the fallout from the Zimmerman verdict settles down. To borrow again from John Farnam, don't do stupid things with stupid people in stupid places. Stay safe out there! Some Thoughts About How Good Do We Want To Be? You change guns like one would change underwear... I appreciate the availability of high end guns, but your muscle memory and shooting ability has to suffer. 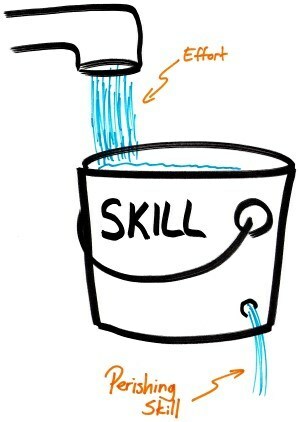 Since shooting is a perishable skill it is like a bucket with a hole in it. All of the time you spend dry-firing, visualizing skills, and practicing on the range is the effort you put into building that skill (I am assuming that it is 100% effective training). 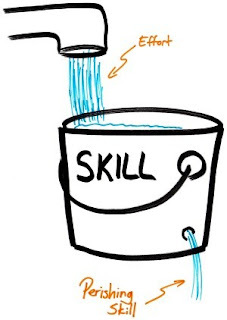 At the same time there is a whole in the bucket and some of that skill is leaking out because of time and as we get better it leaks out faster because of the extra pressure. Furthermore as we age our reflexes may slow, our vision deteriorates and the more out of shape we are that hole gets bigger. As long as your effort exceeds the leakage, you get better, if it doesn’t you get worse. If you want “to be as good as I can possibly be” then you have to focus on shooting to the exclusion of all else. Not practical. Years and years ago, when I was a serious USPSA competitor, I had a regular training schedule that included daily dry-fire, 2 live-fire training days a week, physical training (including lifting weights and aerobic and sprint training) and a match AT LEAST very other weekend and usually every weekend. Add to that the time spent reloading, time spent setting up and running matches, time spent taking classes and seminars, time spent futzing with gear, etc....lots of time, and for someone who was self-employed (even with a percentage of my time sent working on gun articles and for USPSA), that time translated directly into money not earned. All that time (and no small amount of money) bought me a "slot" as a competitive club shooter. Not a competitive national shooter, but I was headed there. A key point here is that I had to be very, very — no, exclusively — focused on USPSA Limited...weak point training, very specific dry-fire, blah-blah...you guys know the drill. I took a break from USPSA for personal reasons (life changes) and became a pretty good age-group triathlete, which led me to extreme sports, which oddly enough led me back to practical shooting. I came back into USPSA as a "C" Open shooter...my bucket had leaked a bit. Eventually became involved in the launch of IDPA (I am member A000009) and spent a number of years shooting that sport. My huge overwhelming flaw as a competitor is that I have the attention span of a gnat. The irony is that my short attentional span, coupled in with a great memory and an ability to focus in very quickly, made me a really good journalist, which in turn allowed me to be self-employed for my career. It also turned out to perfectly suit me to television production, where Adult Attention Deficit Disorder is practically a prerequisite for employment. As Ron noted, I no longer have the time to do what needs to be done to compete at the upper levels, not and continue to do what I do in Television World. And, honestly, time is running against me...although I flatly refuse to believe it! I've also found my interest has changed a lot over the years. I love cowboy action shooting and Wild Bunch, and I'm good at it (plus I've got the hats). I'm fascinated with 3-Gun and, so far, I'm terrible at it, but I'm looking forward to riding the that early stage of the learning curve up up up. I'm a lot more interested in rifles than I used to be, and I see long-distance precision shooting as the Great Uncharted Country. Oh wait, and sporting clays...I can see why people obsess over sporting clays. So yes, I give up ground on the "muscle memory" question, although I think it's more properly termed a neural programming issue. I figure as long as I'm willing to "play the fool" I'll be able to muddle through all the various competitions (and, I'm hoping, African plains game with a Ruger .300 Win Mag in September). As the great Robert Heinlein once noted, "Specialization is for insects." Spent the week at GUNSITE filming the first 4 eps of RAPID FIRE. We've retooled the show a bit, and we all think it's really going to rock. Tge days, however, were long, long, long and brutally hot, so, yes, I slacked on the blogposts. Sorry! So what we have now is a trial so tainted by prosecutorial misconduct and political pressure it has become something you see on TV about kangaroo courts in Third World countries, a very dangerous precedent to have. And I don’t care if you think Zimmerman is guilty and that he should spend the rest of his life in prison, this is not the way that a verdict of guilty should be achieved and we should not be accomplices on the travesty because it will make us feel better. If we let feelings corrupt our rights to a fair and impartial trial, you can bet your life it will be used against others and even yourself. I have the Ruger Rimfire Worlds in Tulsa next week. I may or may not shoot the whole match,l but we'll be filming for SHOOTING GALLERY. I've changed my mind completely on what I might shoot...I may use a Tac-Sol conversion unit on a Rock Island frame, along with a Ruger Target 10/22 and am Aimpoint. Or, heck, I may change my mind again...and again...and again...until Saturday. I'm going to be working hot and heavy next week on RAPID FIRE, but I hope to carve out some time on the range. Since the next major match is Ruger Rimfire, I'll be focusing on .22, chewing through my reserves of ammo. Thank heavens I hoarded! BTW, I've been using these horizontal mag holders from MagHolder and have been very pleased. 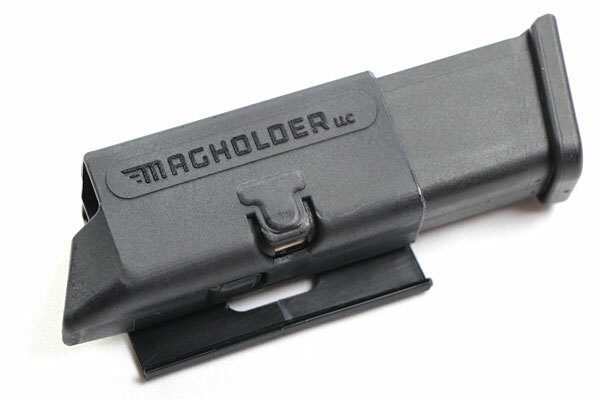 I ordered a couple of mag holders for the Sig P938 and the Colt Defender 9mm 1911. As you guys know I like horizontal carry for CCW...a viewer's eyes are less likely to take note of a horizontal pouch than the more typical vertical pouch. I'm trying something different, using a left-hand pouch with the base of the magazine facing to the rear, hopefully a little less visible from the front (and just as easy to draw with a little practice). I used the Mag Holders last week while I was on the road. 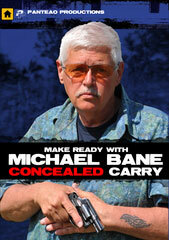 Here's a longer review from my friend Richard at Guns, Holsters, Gear. ...I shot well today, but with a couple of el stupido disasters...I missed a shotgun plate, the pick-up of which cost me about 4 seconds, and on the next stage missed a slam-dunk 10 second bonus plate. I'd gamed the stage and, heck, had already subtracted that 10 seconds from my overall score. Chicken...Counting...Eggs...Unhatched...etc. We'll see how I finish, but I'm not optimistic. I do anticipate finishing higher than I did at last week's He-Man 3-Gun, which was 3rd from the bottom! Next big match is Ruger Rimfire Worlds in Tulsa the weekend of 20 July. I'm shooting a red dot on the rifle (Tactical Solutions X-Ring w/Tac-Sol trigger); irons on the pistol (Ruger Mark III frame by Majestic Arms; Tac-Sol Pac Lite top end). Haven't made a decision on the dot...I have a Lucid and a Aimpont T1...if I get down to the closing minutes, I'll default to the old Tasco Pro Point. A troubling piece, and one well worth reading. Good words for anyone out in the Real World trying to make something — anything — work. Last night around 1:30AM a really powerful thunderstorm rolled through the mountains here at the Secret Hidden Bunker. It woke me up, and in a flash both Alf the Wonder Beagle and Pokke-san the Tailless Cat were on the bed, holding copies of their Pet Contracts that clearly stated when there were REALLY LOUD NOISES outside and massive fireballs launched by Gods Both Named and Unnamed, the COMPANION ANIMALS GET TO SLEEP IN THE BED, TAKE UP ALL THE SPACE THEY WANT AND PROVIDE COMFORT AND SUCCOR TO THE HUMAN GUARDIANS WHO ARE PROBABLY AFRAID, TOO. What could I say? Roughly translated, "HAVE RECEIVED HISTORICAL DOCUMENTS...MASSIVE ARMADA IN ROUTE...NOTIFY SPOCK." Why is it that 4, or 5, or 6 stages in a match in the heat takes so much out of one? I'm whipped! I think I did pretty good today on the first day of the Rocky Mountain Raid, but I made a couple of small mistakes that'll bump me down in the final ratings. Tomorrow, hopefully, no mistakes, small or large. One of my slips was a miss with the rifle on the last plate (duh...Michael headed back to the barn!) during a run in the high 20 seconds. Definitely a low-key holiday...my Sweetie and I are cooking, but it's pretty simple. I found some Stone Smoked Porter BBQ sauce in the People's Republic yesterday evening when I was buying a replacement for my pepper grinder that finally gave up the ghost. So today I'm going for BBQ wild-caught salmon with the smoked porter sauce and baked beans with yet another BBQ/chile sauce that I make myself from recipes from Mustard's Grill in Napa, one of the world's great lunch restaurants (get the tuna sandwich). My Sweetie is contributing Southwestern Potato Salad from a Bobby Flay recipe...it's her favorite. Beerwise, I'm going for Prost Brewery's Altfrankisches Dunkel Bier...I've really gotten into Franconian beer since my visit to Germany last month. It goes perfectly in my Zwick'l Kellerbier ceramic mug that was a gift from the execs at Steiner Optics. I'm hoping I can lay my hands on a Steiner 1-5X Military when they begin trickling into the U.S. to go along with the mug. It's definitely on the short list for an Africa scope. I'll be shooting the Rocky Mountain Region Raid cowboy match this weekend. I really only wanted to shoot the Wild Bunch side match, but the best-laid plans, etc. I loaded cowboy .357s yesterday, so I'm good to go for the match, except for the finger I got stuck in the Dillon while I was trying to clear a primer misfeed. Note to self...remove finger before pulling down lever...LOL! We also got out on our mountain bikes today for an hour ride "around the neighborhood." The neighborhood around the Secret Hidden Bunker, however, is dirt roads, short steep climbs and quick drops...a darn good workout! My Sweetie had some hip problems last summer, which blew out our biking time. She has a new Trek Mamba 29'er she just got fitted by Andy Pruitt and his team, and she wanted to give it a try. I rode my old Gary Fisher 29'er, which has been a workhorse...the Mamba is more or less the Trek version of my old Gary Fisher, since Gary Fisher sold to Trek. I'm hoping to spend a little time with the long-range rifle, an FNH TSR-XP in .308 with a 24-inch barrel. I'm going to put a Bushnell 8-32X on it until I decide on a final scope choice. Iain Harrison (yes, we are ALL our IMDB page!) has been teaching long distance shooting and I'll be with him soon filming RAPID FIRE season 2...hoping to talk him into some private lessons. It's obvious from my pathetic 3-Gun performance that I need to just be able to make the occasional long-range shot, but I need to really understand how the whole machine works. Iain is a great instructor, and I think he can help enormously. If I may borrow phraseology from Bill Paxton, today we celebrate our Independence Day. The freedom that we so casually barter away for a false sense of security, for a libertine lifestyle under the benevolent gaze of Big Brother, for the release from our personal responsibilities, was paid for in part by the men in that iconic picture...plain dirt farmers, immigrants from Germany, Ireland and the dregs of the northern cities, all too poor to buy their way out of the great bloodletting, who gave their last full measure of devotion on a field in Pennsylvania 150 years ago. Family history tells me that my ancestors, who had not all shed the "Mac" in front of "Bane," were not at Gettysburg. 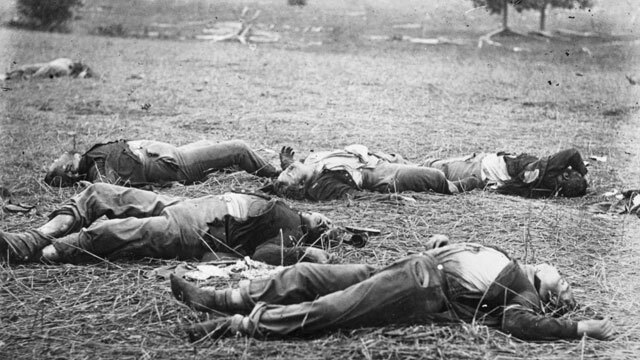 Instead, they marched under St. Andrew's Cross with the Army of Tennessee to Georgia and the great failing battles against Sherman, retreating on foot, often barefoot, through the early winter back to Tennessee to give their last full measure of devotion against the fortified Union positions south of Nashville, in Franklin, in the bloodiest 4 hours of a bloody war. ...what difference does it make? Five words that may come to define our era. What difference does it make? That, my friends, is what we as Americans — as the people who carry the DNA of the Founder's dream — must decide. The Constitution is not an instrument for the government to restrain the people, it is an instrument for the people to restrain the government." Last week, one week before we celebrate our "Independence Day," I spent a lot of time putting the ole John Hancock on specially drafted assignment forms placing each and every magazine of greater than 15 rounds that I or my Sweetie own into our Gun Trust, one form for each magazine. The firearms went into the Trust in late February. My plan is that any future firearms, especially Class 3 items, will be sold directly to the Trust as opposed to an individual. We will prevail in this, and damn them all come 2014! I also survived the He-Man 3-Gun Championships at the Whittington Center last weekend, although I'm pretty certain in LAST place...LOL! It was absolutely a hard match, a marksman's match, and the people there are the best of the best. I would say that they made the stages look easy, but they didn't...they made themselves look really, really good. I was (surprisingly) very pleased with my performance with the rifle, the Colt 901 7.62. As you guys know, I fitted the rifle with a Leupold Firedot 1.5-4X in Burris PEPR mount last week and sighted it in with Federal 168-gr Sierra Match, one inch high at 100 yards, since I could only get to a 100 yard range. The bulk of the long-range rifle targets were in the high 200-320 yard range, and the rifle was a rock. I POA'ed the 200 yard targets and went to a point between the crosshairs and the first hashmark (360 meters) for the 300 yarders. On my best shot on the 385 yard plate I used the first hashmark as the aiming point. I also used the green Firedot in its lowest setting all the time, as it made it easier to quickly obtain the crosshair. Also, there were a LOT of close-in rifle paper (full-size and I believe 1/3-size IPSC targets) either before or after the long shots, which were offhand, kneeling and prone. I used the dot for anything close in. BTW, most of the rifles were AR-10 variants, mostly set up for 3-Gun just like the 5.56s. Zoot Suit founder Jason "The Hustler" Huss, studly guy that he is, shot the match with an iron-sighted PTR 91 and did great! We also had a 550-yard shot with a "pick-up" rifle, a Savage .308 with a 6X scope. The shot was prone, with the rifle off a small Caldwell rest and a rear bag if needed. The tricksy part was the scope was mounted on an AR mount, thus about an inch, inch and a half, too high on a bolt gun! As they told us going in, it would be impossible to get in a classic prone position with a good cheek weld..."didn't want to make it too easy," we were told. LOL again! Every single person in our squad made the shot, and every person used a different technique to deal with the awkwardly mounted scope. My technique, based on a hint from our excellent range officer, was to use my left hand on top of the stock to give me a much higher cheek weld. On a normal prone, I would use my left had to snug the stock into my shoulder and adjust the elevation. It was a little rickety, but it still allowed me to make the shot. The Benelli Nova worked great. I picked it up Thursday afternoon, fitted it with with a +7 Nordic tube, ran a bunch of dummy rounds through it and Friday AM took it to New Mexico. I was faster with my shotgun reloads, but not NEARLY fast enough...for example, we had a 40+ round birdshot course, and every piece of steel you hit launched clays or triggered stars or spinners. Yikes! I think I only hit one slug shot, because I hadn't been able to run the shotgun with slugs before the match and I had no idea where it was hitting. My bad, but I knew that going in. The Nova has a 24-inch barrel and a red fiber optic front bead. I would have killed for a set of rifle sights on those 100-yard uphill or downhill slug shots! My favorite shotgun run was on 10 30-50 yard full-sized pepper poppers with buckshot. I went to a full choke with Wolf heavy #00 buck...I have bruises, but darn, those poppers went down quick! I had trouble with the 40-50 yard pistol plates, and I have not the slightest excuse for that. The Wilson 1911 will deliver (and has delivered at those distances in the past), but I wasn't there for it last weekend. Something to add to the training list! I had no malfunctions with any of the guns during the match. I did NOT detail strip them to clean before the match, but did a light disassembly and a quick clean, followed by lubing with Ballistol. Whittington is dry, dusty and hot this time of year, which is hard on guns, and I've had good luck with Ballistol in those conditions.